On the 23rd of July my students made their final presentation of their graduation project after a semester of work and about a month of hard work. Well, some worked hard and some not as hard, like always and that was easy to see on the projects and presentations. There was a jury of three, one from the school and two from design agencies in Maputo and then a full room of audience. The students presented their work and got critic and praise. I am happy with their performance even if I wanted more from many of them. 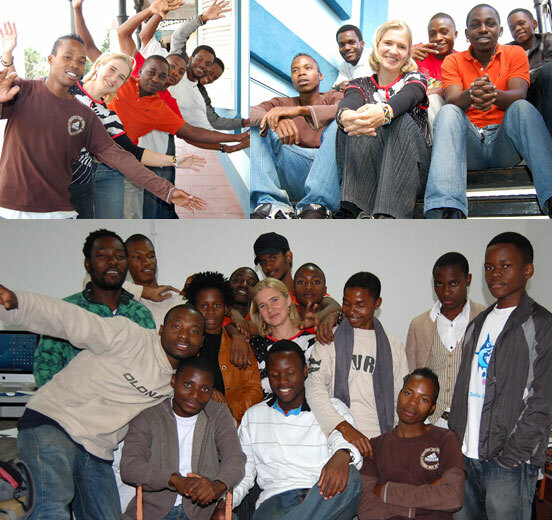 When I look at their projects from when I came in the beginning of 2009 I can see a huge change. Concratulations with your graduation projects Alice, Armando, Atanásio, David A., Jose S., Jose T., Rejão, Tomas and Webera! All kinds of pictures had to be taken! This semester I have been working with the 5th year like last year. I only had one semester with this group, a great group! My only wish would be to have more girls. In this group there are 15 boys and 1 girl. This time I tought the course ‘edição electronica’ and photography. There are talented students in this group and there where some nice projects. Thanks for the cooperation all of you and I wish you all the best and a great future! Graduate students working hard… even if they should work harder according to the teacher! The final students in graphic design in ENAV will defend their work on 23rd of July, in less than two weeks. There are still many things to do but the work is taking a shape! This is the group I have been working with since I came here and I was their supervisory teacher last year. Since Christmas they have been working as interns in design agencies in Maputo but coming to school on monday and friday afternoons to work on their final projects. Most of the students finished their three months of internship in May/June and some of them have already made a contract to continue to work there as graphic designers. In the end of the semester last christmas we had meetings about the final projects, about ideas and what to do. 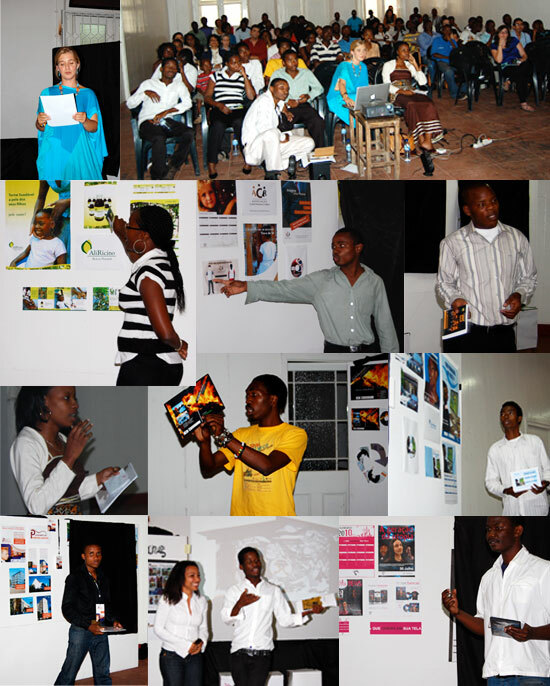 Some of them presented ambitious ideas and they all had ideas that could be developed into a final project. In the period they are interns they have 8 hours a week in the schools schedule to come and work on their final projects. It has been a bit challenging to get the students to come to school that period. When working in the graphic agencies they have projects there and it can be difficult to leave that and go to school, and as many of us graphic designers know, they think they have a lot of time until suddenly the end is close! 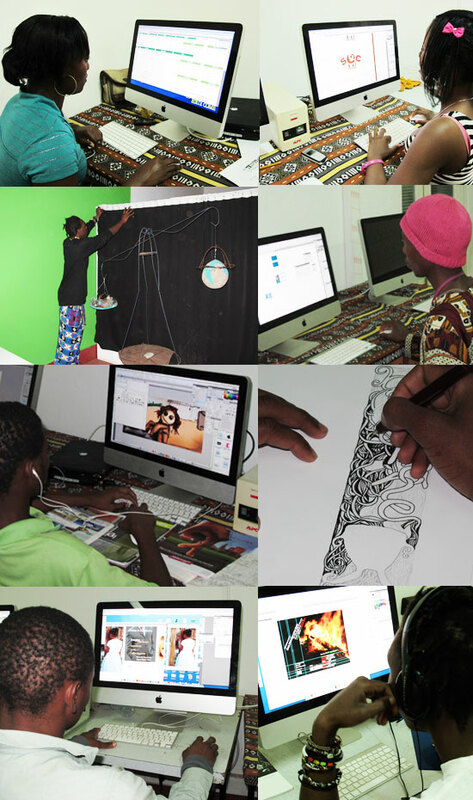 But most of them though have attended school, some more some less, and used their time and access to the graphic studio in school to develop their work. These eight hours a week are not enough to finish the projects. But next semester the finalists are not part of the plan in school and they do not have access to the media lab, as it is fully booked for classes with 4th and 5th year. There is also no teacher to attend them. Next semester my colleague Paulo, which is here on behalf of Identidades (a portuguese project) will have to teach most of the classes as I will go in August. Last years final students had their presentation as late as October and it was quite caotic because they did not have access to the media lab and had great difficulties in succeeding to finish their work. The school has a month long winter vacation from the 19th of june and then the graphic room/media lab is free. I decided to stay there from 9-17 in the vacation period working with the final students to give them opportunity to work hard to finish their projects and then have the ‘defesa’/final presentation right after the school starts so they can finish and graduate. My work period here ended in June and there was not a will to continue my contract for one month to finish this work. I was sad about leaving without finishing the work so I talked to the leaders in school about the possibility of staying anyway. They appreciated that and agreed it was important I finished off this work. So I bought me a new ticket home in august and was so lucky to be able to stay in a very nice friends house here in Maputo. The work is going well and the spirit is up and the students are ambitious. I really am enjoying working with them. I will post the results after the ‘defesa’. One of my students designed a logo for his church in one of the projects this semester. Now he finished the logo and asked me to come along to his church to present and give away the logo. So last Sunday I went there and met his youth group. Very nice group of young people. Begildo presented the logo and the visual identity manual in a slide show. Then the group discussed and brought up questions. Why this color? Why are there three smiling faces? How to use the logo on a red t-shirt… Begildo had most of the answers ready. The group were happy and grateful to have the logo. The priest came after the presentation so he got an extra short presentation and held a little speech. I think Begildo did a nice job. 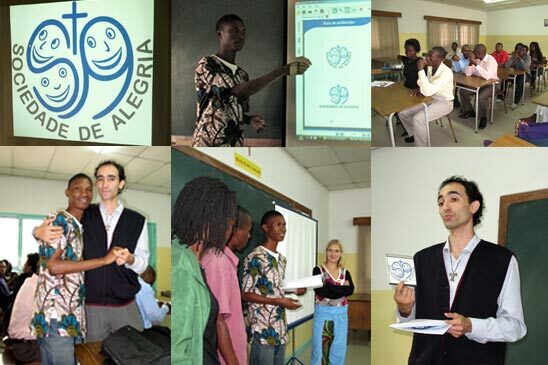 He manages to use the main letters SA, Sociedade de Alegria (society of joy) in a happy and joyful way. Blue is the color of heaven and the three faces are a symbol of a society/group of people. Then I went to Begildos home to visit his family. There I was served a nice lunch and Begildo showed me nice artwork he is doing at home. 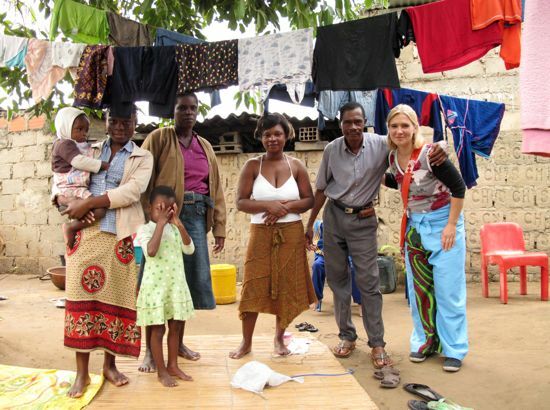 Great news: Recycling in Maputo! One of the difficult things of moving from Oslo to Maputo was changing the ‘garbage habits’… In Oslo we separated all our garbage and took to recycling station close by. We even had a separate bin for paper in front of our building. Separating and recycling garbage also effected our consumption. Separating the garbage makes one more aware of the amount of it and when it takes an effort to throw you also think about buying less and collecting less garbage. Our criteria for selecting products were among other things, if it could be recycled and the less packaging the better. We had the policy of leaving the packaging garbage in the store, only taking the product itself home (hoping the store would push the producer to reduce packaging). It is great that this option is now available in Maputo. 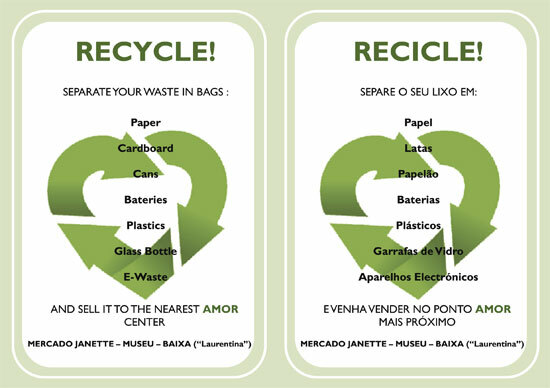 AMOR; Associação MOcambicana de Reciclagem has opened three recycling stations. First task is to organize more garbage bins at home and get the trip to the recycling station into the busy everyday life! I will start today. Lets all do that! A Associação Moçambicana de Reciclagem (AMOR) vem por este meio informar da abertura de tres “eco-pontos” na cidade onde podem deixar o vosso lixo seleccionado em sacos (de segunda a sexta das 8h as 16h). A AMOR recolha todos resíduos como papeis, papelão, plásticos, latas, garrafas de vidro e e-waste. Os resíduos serão pago por kilo consoante o tipo de produto. Em breve, sera organizado uma recolha gratuita dos seus recicláveis nos perímetros dos “eco-pontos”. Os “eco-pontos” sao contentores verde nas zonas de Coop, Museu e Baixa. The Mozambican Recycling Association (AMOR) is please to inform you the opening of three “eco-points” in the city where you can deposit your selected waste in bags (monday to friday from 8am to 4pm). The AMOR collects all residues like paper, cardboard, plastic, cans, glass bottles and e-waste. All waste will be paid per kilo regarding its category. Shortly, we will put in place a free collection within the perimeter of the “eco-points”. The “eco-points” are green container in the areas of Coop, Museu and Baixa. A.MO.R. (Associação MOcambicana de Reciclagem). Stephane Temperman; Presidente, +258 84 46 177 64. 6865, Julius Nyerere, Hulene, Maputo, Moçambique. Must be packed in bags. plastics must be free of fiber, and packed in bags. 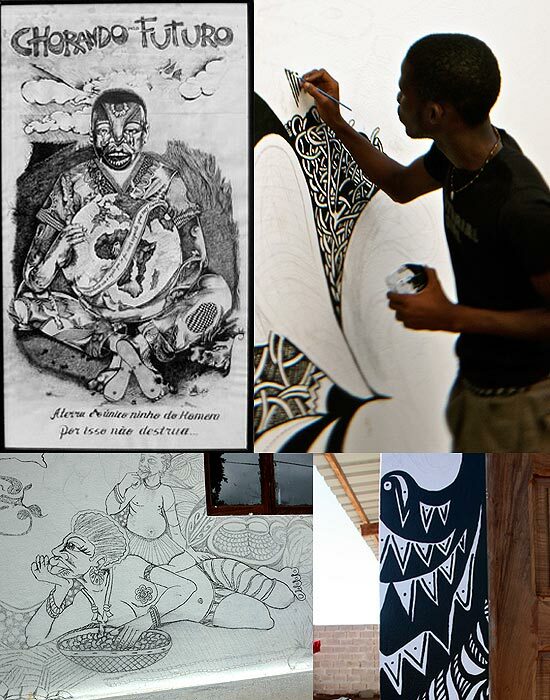 Rejão was asked to decorate the recidence house in a new art venue in Matola called Dansarte. Maria Helena Pinto is constructing an exiting site there with a theater, cyber cafe, swimming pool, beautiful garden and houses for artists in recidency. Maria saw Rejão´s illustration here below (Chorando pela Futura) on Facebook. She liked the style and contacted Rejão to ask him to illustrate there. It is an exiting project for Rejão and it looks like it will be a really nice peace of art. Here is Dori´s blog about our visit to Dansarte.